Have you ever wished for a second chance at something? I am sure that I have wanted chances at many things throughout life, but I trust that the Lord granted me the chances (and second ones) that were best for me and that provided the opportunity to do what He desired for me to do. Last year, I got my second chance at thanking my former pediatrician for the care he gave me. Dr. Hamburg had been my pediatrician ever since I was a little girl. He happened to be gone on vacation the week that I became incredibly ill. I lay in the hospital slowly dying while various doctors tried to figure out what was going on with me. My mom told me that as soon as Dr. Hamburg arrived back in town, he immediately came up to the hospital, read my chart, took one look at me, and then panicked. He quickly ordered a CT scan which revealed a mass in my abdomen. This in turn led to exploratory surgery to find what was believed to be a mass. The mass was actually my uterus which was extremely swollen and filled with massive infection. Dr. Hamburg also called in a new ob/gyn surgeon with wonderful credentials to perform the life-saving surgery. I know, or at least, firmly believe that if he would have waited just a few days to return to the “office” after his vacation, I would have never made it. There were many hands that touched me during that time and all of them played a part in saving my life. However, I know Dr. Hamburg did not accept not knowing what was wrong. He hastily came to the hospital and did not stop until he found the reason why his otherwise very healthy patient lay withering away. That is the back story of Dr. Hamburg. I also want to share what I believe is the Lord’s gifting of a second chance for me. Here it is…. My first chance at something I had wanted to do happened at a local grocery story about a year and a half ago. I looked up while pushing my cart around and saw my former pediatrician, Dr. Hamburg, shopping. I studied him closely. He is probably close to 80-years-old now and even though I knew it was him, I just wanted to be sure. While I was trying to get the nerve up to go talk to him, I lost sight and, like that, he was nowhere to be found. I hastily walked from aisle to aisle looking for him but could not find him. My chance at telling this doctor who had a huge part in saving my life was gone. As I walked out of the store, I felt the Lord saying to me “Caroline! I gave you the perfect opportunity and you blew it!” Oh my…I am sure our Heavenly Father just wants to throw His hands up sometimes with frustration! I know this is something that He wanted me to do. I have felt so led in the past few years to reconnect with pivotal people in my life who were in the trenches with me and my family during and after my hysterectomy. The rest of the night and several days…okay months…passed and I could not get Dr. Hamburg out of my mind. Last summer while heading into a store I looked up and there he was carrying a bag of groceries to his car. I walked past with my sunglasses on so that I could give him one last look just to make sure. As I was getting closer to the door of the grocery store, I realized this was the second chance I had been hoping for. I immediately turned around and scurried as fast as I could to his car. Nervously, I walked up and said “Excuse me, are you Dr. Hamburg?” He said “yes”. I then said “I don’t know if you remember me but I’m Caroline and I was one of your patients.” He studied my face closely, but did not seem to be quite sure of whom I was. He then said “How are you?” I said “I’m doing really well.” He said “You have a sister right? How is she?” I said “Yes I do. She’s doing well.” He then introduced me to his granddaughter. Now at this point, I could tell it was about to get awkward as he just kept searching my face trying to recall who I was. Of course, by this time, tears were streaming down my face. I looked at him and his eyes that were filled with wisdom from the years began to well up with tears that eventually made their way to his cheeks. He leaned forward and hugged me saying “thank you”. As I told him about being the mother of two wonderful children adopted out of foster care, he just stood there, staring, with tears rolling down. His granddaughter was smiling from ear to ear. We said our goodbyes and I turned around to enter the store. I felt like I was flying. My heart and mind were so excited, thankful, emotional, and in awe of what just occurred. I am so incredibly thankful for the second chance God gave me to run into Dr. Hamburg again. I don’t even know if chance is the right word though. I have learned through the years that nothing really happens by chance after all. I believe that our Heavenly Father is and always will be the creator of opportunities, and the writer of those golden moments where we can shine for Him, show love, and express thankfulness for the works He set His children to do on this Earth. Here in my little corner of the world, school is getting ready to start back in session. My son will begin kindergarten this year and, needless to say, I’m filled with excitement and a little bit of dread all wrapped up together. We get to meet his teacher next week and I hope I see in her or him the kind of energy my son thrives on and that every parent desires for their children’s teachers. I do know one thing though, the school district will be missing a great teacher and counselor this year. Mr. Martin retired at the end of the 2011/2012 school year after 30+ years of teaching and counseling kids. He was my 6th grade teacher and turned out to be one of the best teachers I have ever had. I remember getting him for my 6th grade year and being so excited about it. Male teachers seemed to be a little bit of a rarity back in the early 80’s. Looking like he had just stepped off the college campus and into our classroom, it was always exciting to see how he was going to try to teach us. I became ill early in the school year. The morning that my illness struck, Mr. Martin noticed that my color was not right. I was normally a talkative girl, but on that day, I was quiet and different. He sent me to the nurse’s office to be checked out and the decision was made to call my mother. Not long after this, I was in the ER and, of course, the rest of my story unfolded. Mr. Martin came to the hospital nearly every day after school to check on me and keep me up to date on school work. He was ever-present and truly wanted to know what was happening and if I was recovering. He provided support to my parents and family members as well. If it had not been for him I would probably have had to repeat the 6th grade. After all, I was only in school less than a week or two before I became ill. I ended up missing between nine and twelve weeks of school due to it. He tutored me while in the hospital and at home while I was recovering. I laid in bed the whole time while he read the lesson plans to me. He would stay at least an hour at a time twice per week. I was so ill that I do not specifically remember each time he was there, but I just knew he was. It is like my subconscious has always known. The image of this teacher sitting by the bedside to teach a gravely ill child brings tears to my eyes. How lucky I was to have him. During my recovery, he gave me the book “The Littlest Prince” by Antoine De Saint-Exupery as an assignment to read and write a report on. 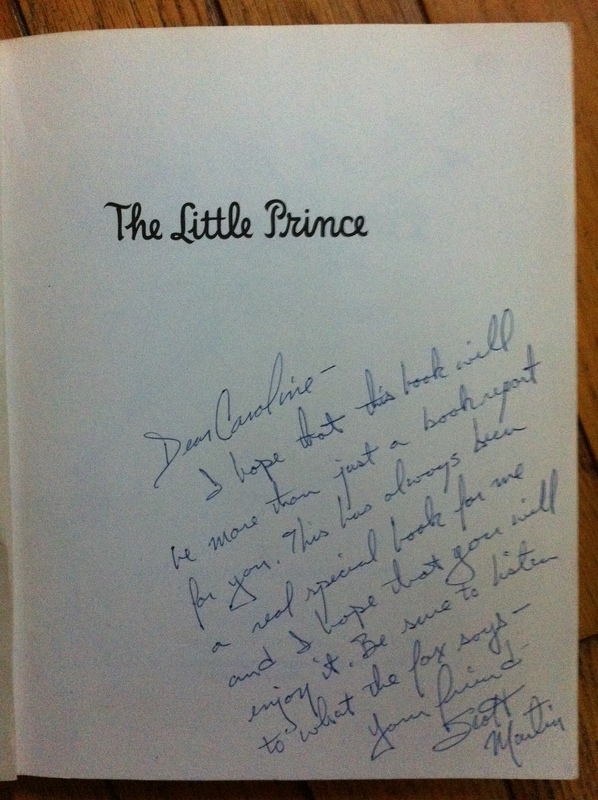 Inside the front cover, he wrote a note to me that this book had always been special to him and to make sure I paid attention to what the fox says. I remember reading the book and writing my report but to be honest, I really did not understand it fully. Many years later, I found the book among the trinkets of my childhood and reread the conversation between the fox and the little prince. “Goodbye,” said the fox. “And now here is my secret, a very simple secret: It is only with the heart that one can see rightly; what is essential is invisible to the eye.” “What is essential is invisible to the eye,” the little prince repeated, so he would be sure to remember. “It is the time you have wasted for your rose that makes your rose so important.” “It is the time I have wasted for my rose” said the little prince, so that he would be sure to remember. “Men have forgotten this truth,” said the fox. “But you must not forget it. You become responsible, forever, for what you have tamed. You are responsible for your rose….” “I am responsible for my rose,” the little prince repeated, so that he would be sure to remember. A few years ago, I met with Mr. Martin at his school. It had been nearly 30 years ago since everything happened. I had run into him from time to time throughout the years, and gave him the standard and very brief update that I was doing well and what my job was at the time, but I really did not discuss much. This time though, I purposefully sought him out. He is a part of my memories of this time in my life. It would be an incomplete history without him. I asked him why he assigned The Little Prince for me to read. He said, “It is a book that was always special to me and has meaning that translates to different moments.” It is not just a book about survival, but a book about overcoming and transcendence. I get it. I may not have gotten it as a child, but I get it now and what great insight and foresight he had to assign this book to me. I now see the great meaning behind seeing truth with the heart and not the eyes. My rose, the one that I am responsible for, the one that I have spent time on, the one that I have tamed is really not a rose at all. It is the way I have handled my life – the goodness and the tragic. I am responsible for all of it the rest of my life. My rose is myself. I learned that the other children asked about me and were told I was recovering from surgery, but were not aware of all the details. He described me as being girly, but like a little tough bull and seeing me one day like this, and the next minute close to death was difficult. He recognized that I had to deal with adult issues and that “strange time” of my life was taken from me. By strange time, he meant when our bodies are changing and puberty is starting. The most important thing for me to accomplish when meeting him was to tell him that he was the one teacher I will never forget. He was the teacher who showed care, kindness, and empathy to me and my family during a very difficult time. We all have that one teacher who inspired us, who mentored us, or who held us accountable. Mr. Martin was all of these things, but for vastly different reasons. I could see how it would have been easy to either totally disengage while I was in the hospital or to just pass me along out of sympathy, but he did not do this. He got paid a stipend for tutoring me and with the money he bought a clock for his mantle. He told me he would have never let anyone else teach me, and regardless of where I needed to go, he would have followed me. The clock, kindly referred to as “Caroline’s Clock”, still sits on the mantle of his fireplace. His family knows this and refers to it by my name as well. I think he basically summed up why he was the best teacher I ever had and why he has left an endearing imprint on my heart and life, and I am sure, on the hearts and lives of many other children he has taught. Happy Retirement, Mr. Martin. Thank you for the positive influence you have made in the lives of hundreds of children throughout the years.